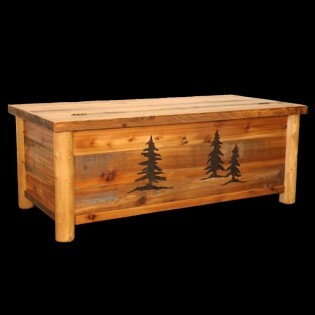 Storage for seasonal blankets and clothing can be found under the lid of this barn wood blanket chest. Our Barn Wood and Log Blanket Chest features clean peeled log corner posts and recycled barn wood that has a clear finish to highlight the natural beauty of the woods. It is further accented with three large carved pine trees.